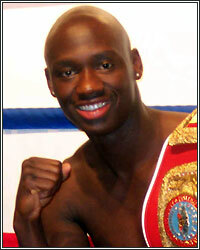 ANTONIO TARVER: "I WANT THAT HEAVYWEIGHT TITLE...I'M CALLING THEM OUT; ANSWER THE PHONE"
"I'm still here. From the '96 Olympic team, you got two fighters who are still relevant, that's me and Money Mayweather. So I stand on my ability and my gift and my talent, and like I said, I ain't ready to go nowhere. I want that heavyweight title, so after Wladimir gets through sparring over there in England, or wherever he at, he can come see me...Where else are they going to go to fight somebody with my credentials and that can make them a household name overnight if they're fortunate enough to win...They can't deny me. I'm 215 pounds right now and I'm working out. They can't deny me. I'm ready. If I'm calling them out, answer the phone. You cannot fight Mormeck and then fight David Haye, I mean, a guy that's 6'3" and I'm bigger than him naturally. I mean, why can't I deserve that fight. I just proved, by knocking out Danny Green, that I'm a threat. I can carry my power up to the heavyweight division...All these guys out here are picking that low-hanging fruit; that fruit that already done fell to the ground from the tree that's laying on the ground. They don't want to climb that mountain and grab that pretty ripe apple that's way up there in that tree because that's work; that's work. That's what they all doing, just picking that low-hanging fruit, but when they get tired of fighting those bums that can't fight, they gonna have to come fight a legitimate fighter that has forgotten more about boxing than half these guys even know," stated former light heavyweight champion and current IBO cruiserweight champion Antonio Tarver, who made a surprise call to FightHype radio last night to address a number of issues, the most important being his strong desire to win a heavyweight title and the reluctance of the champions to face him. You do not want to miss what else he had to say as Tarver spent nearly an hour discussing the Klitschko brothers, Alexander Povetkin, David Haye, Bernard Hopkins, James Toney and much, much more. Check out some of the highlights below and be sure to listen to the audio for the full conversation (fast forward to the 1 Hour, 10 minute mark). None of these guys really want to really gamble with me because they know I can fight, you feel me? I got so many multitudes of ability. One thing I can truly say, man, outside of the Hopkins fight, I really haven't been touched. I'm in a position where I've taken enough risks in my career, and if I'm going to take a risk, I mean, the reward is going to have to match the risk. There's only a few fighters out there that the reward actually matches the risk that I'm willing to take. I've paid my dues coming up through the ranks, having to beat everybody ranked above me. I don't know what it is about these people that continue to try to underestimate me. You know, hey, I lost to a guy who was 14 years younger than me. He didn't knock me out. He didn't blow me out. He didn't do anything. When they called the one knockdown, that was a total slip, you feel me, and that's what it was, so, you know, I stand on my ability, I stand on my boxing, on my career; I stand on it, you know what I mean? There ain't but two people who can say that they beat me that I haven't avenged those losses in dramatic fashion. I'm still here. From the '96 Olympic team, you got two fighters who are still relevant, that's me and Money Mayweather. So I stand on my ability and my gift and my talent, and like I said, I ain't ready to go nowhere. I want that heavyweight title, so after Wladimir gets through sparring over there in England, or wherever he at, he can come see me. And if not him, then David Haye can get ready, you know, if he really wanna fight and show the world that he's still relevant, I'm ready for that fight. If not, they got a guy in Russia named Povetkin; I'm ready for that fight. So, you know, I'm here in the heavyweight division. And if not, if a cruiserweight show himself to be worthy of a fight with me and we can make money if the fight is to be made, and we can put it on a network that will carry and pay the money that it takes, then I'm ready for any cruiserweight. I think I knock out any cruiserweight out there today. I KO any cruiserweight out there today because at 200 pounds, they can't handle it. Where else are they going to go to fight somebody with my credentials and that can make them a household name overnight if they're fortunate enough to win? The money talks, man, and in the cruiserweight division, I'm that guy. That's bottom line. If they want to come to America and make a name for themself, they gotta go through me. That's for every cruiserweight out there. Chris Arreola is a good heavyweight, okay, he's a good heavyweight, but his name don't carry the weight mine does. If these guys really want to come over here and have a big fight, then they're going to have to do what's right; they gonna have to come see me. And I'm not trying to fight everybody in the heavyweight division; no, I'm not trying to do that, but on any given night, I've proven that I can beat any man, and that's what we're telling the world right now. I tell you right now, I got the recipe to beat him because I'm a southpaw. Trust me, at 215, I'm cracking. Like I said, I'm going to get inside...I'm going to be in close. I'm going to be diggin' to the body. He gonna have to fight me with alligator arms, and I just don't think he's gonna be able to reach me with those alligator arms and do nothing. You feel me? I'ma be in close, throwing those lefts, those right hooks, and over the top, that overhand left, which I showed and demonstrated against Danny Green. It's a powerful punch and I can reach a guy that's 6'8" with that punch, I guarantee it. Hey, I got a passport. It's stamped and ready to go, you feel me? It doesn't matter, man. Like I said, I want my opportunity. And like I talked Roy Jones into fighting me, don't let me get started because they can't out-talk me and I betcha I can say the right things to get up under their skin. Like I said, the proof is in the pudding, baby. I'm ready. The proof is in the pudding. I'm sitting back in Tampa and I'm just waiting on that call, you feel me? Povetkin, why they can't have that fight? I think that's a beautiful fight. I can show the world I belong in the heavyweight division. There's something about being a recognized heavyweight in America. That's the whole thing, you know what I mean? These guys really miss America. You know, hey, HBO hasn't shown great fights, they haven't got primetime on HBO in a while, you feel me? And I just don't know if HBO is going to be so ready to give them a shot at Chris Arreola. I mean, I don't know; I can't speak on it, but my whole thing is this, I know that Showtime or HBO would be willing to truly give them a shot if they're willing to come fight me. I just believe that. I know Showtime will, and I can't speak for HBO, but I'm sure with Al Haymon's connection, I mean, that's a fight. It's a fight that I think the people would want to see. They can't deny me, you feel me? They can't deny me. I'm 215 pounds right now and I'm working out. They can't deny me. I'm ready. If I'm calling them out, answer the phone. You cannot fight Mormeck and then fight David Haye, I mean, a guy that's 6'3" and I'm bigger than him naturally. I mean, why can't I deserve that fight. I just proved, by knocking out Danny Green, that I'm a threat. I can carry my power up to the heavyweight division. So, you know, that's what it is, man. And if we can make Povetkin, I'll prove, by beating an Olympic gold medalist, that I deserve a shot at the Klitschkos, period! All these guys out here are picking that low-hanging fruit; that fruit that already done fell to the ground from the tree that's laying on the ground. They don't want to climb that mountain and grab that pretty ripe apple that's way up there in that tree because that's work; that's work. That's what they all doing, just picking that low-hanging fruit, but when they get tired of fighting those bums that can't fight, they gonna have to come fight a legitimate fighter that has forgotten more about boxing than half these guys even know, you feel me? James Toney is a legend in the game. I mean, the guy has the credentials, you know, just like mine, you feel me, and he deserves the opportunity. I'm glad that he's getting it, I'm glad that he's finally taking his career serious, and he's got an opportunity to become a real player in the cruiserweight division because you can't forget, James Toney was at his best when he was a cruiserweight, you feel me? He ran through Vassily Jirov; it was one of his best performances, so I'm not going to sleep on James Toney. If he goes over there and looks great, then hey, he stamped his ticket for the Magic Man; we got action, you feel me? My whole thing is this, man, I'm all about fighting the best fighters out there. I ain't never ducked nobody.